Almost a billion people in our world are living without access to clean water. As a result, the leading cause of death worldwide is illness due to waterborne disease, lack of sanitation, and poor hygiene practices. In fact, every 15 seconds, a child dies due to water-related causes. What’s more, lack of clean water affects children’s education and families’ well-being because children and women walk hours each day to gather water instead of going to school or spending time on other productive activities. Nazarene Compassionate Ministries partners with local churches to provide communities with safe water through the implementation of a comprehensive WASH program that includes water supply, sanitation, and hygiene promotion. 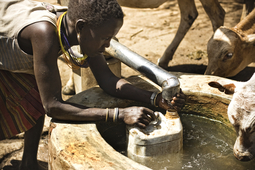 Safe water is provided through resources including wells, cisterns, and filtration technologies. Using resources and education, local churches also mobilize their communities to promote ongoing health and disease-prevention through the promotion of safe sanitation and hygiene practices. By giving to the NCM Global Water Fund, you are supporting safe-water initiatives through local Nazarene congregations around the world. You are offering a cup of water in the name of Jesus and helping churches minister to the least of these in their communities. Be sure to put ACM1423 in the Memo area. Thanks for your donation.